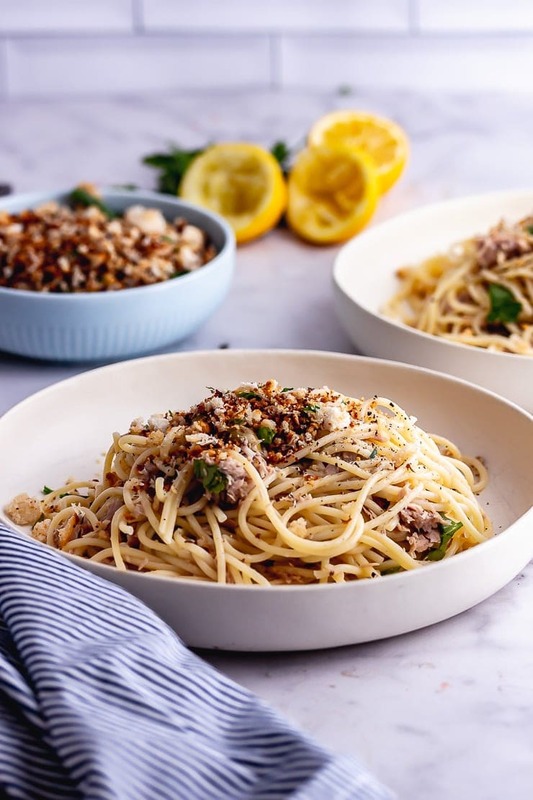 This 15 minute tuna pasta is light and healthy plus it’s so simple to make thanks to the canned tuna. It’s great served hot or cold and makes perfect leftovers for lunch the next day. I don’t know about you guys but any dinner that takes just 15 minutes goes straight to the top of my ‘must make’ list. I’ve been getting a lot of that ‘I just can’t be bothered to cook’ feeling recently. Because of that I’ve been trying to come up with recipes that take the absolute bare minimum of prep but obviously they still need to taste incredible! So this is the start of a new little series of recipes here on the blog which can all be made in 15 minutes. I’ve already got a handful of 15 minute recipes here on the blog like these 15 minute soy peanut noodles or 15 minute salmon pasta with broccoli. 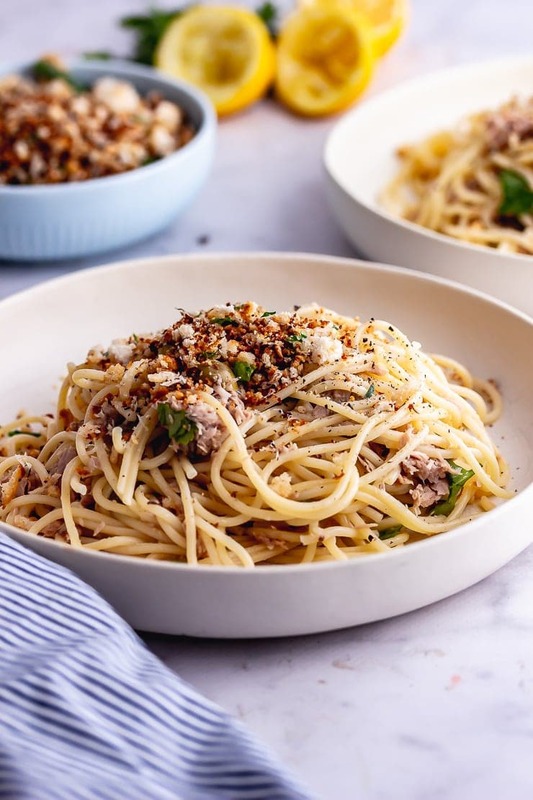 It’s so nice to get home and know that you’re only 15 minutes away from an awesome dinner especially when it’s this super simple tuna pasta sprinkled with a pangrattato that’s bursting with flavour. 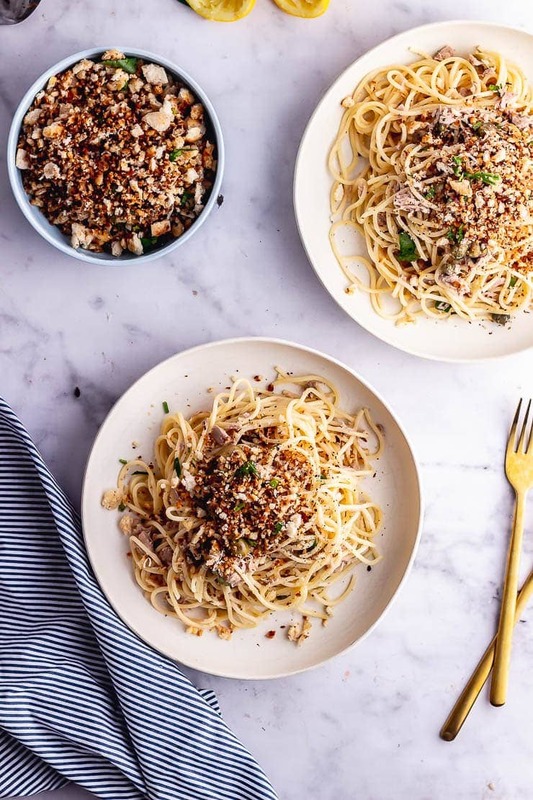 First of all let’s state the obvious it’s so quick to make, in just 15 minutes you can have a bowl of pasta in front of you and that’s pretty much the best thing ever, right? 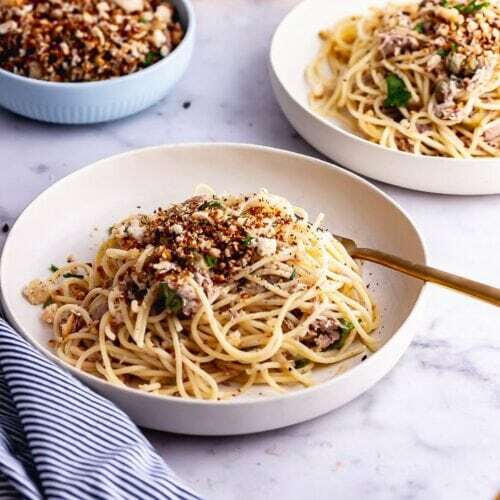 When I was growing up the tuna pasta dish I was used to was a super rich and creamy tuna pasta with a white sauce and sometimes a baked crispy topping. That was a school dinner classic and, I can’t lie, one of my favourites. However, for this tuna pasta I really wanted to make something light and fresh. 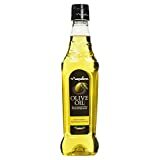 Instead of a creamy sauce I went with a dressing of lemon juice and olive oil which combine with a little pasta water to coat the strands of spaghetti and loads of flavour coming from olives, capers and parmesan. Then of course there’s that pangrattato which adds a ton of extra flavour and an amazing crunch. 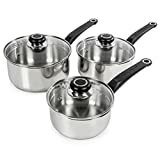 Cook the pasta: Cook according to packet instructions and reserve 100ml of pasta water before draining. Mix: Add all the other pasta ingredients to a bowl with the spaghetti and pasta water and toss well. 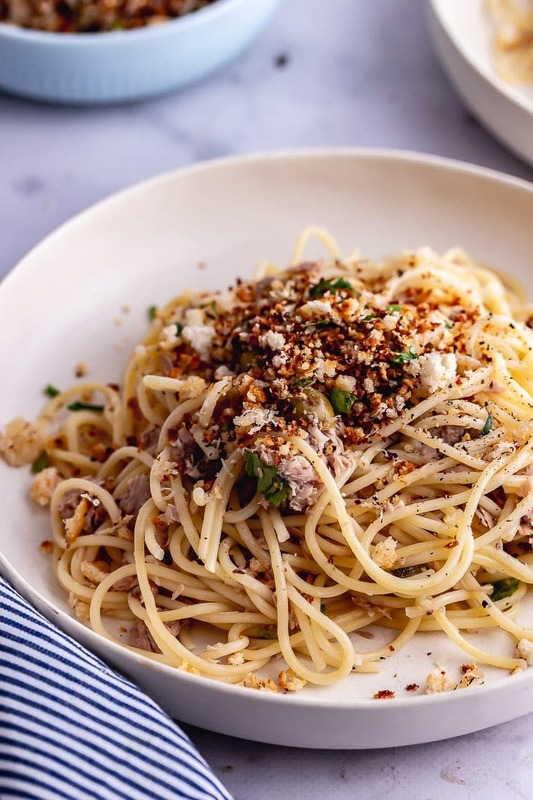 Make the pangrattato: Fry the breadcrumbs in the olive oil until browned, mix with garlic, chilli flakes and parsley. Sprinkle over the pasta and serve. 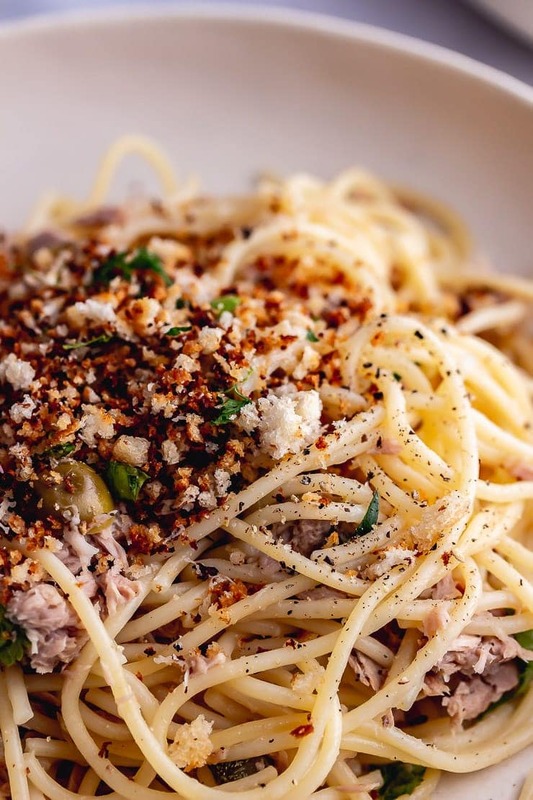 Pangrattato translates from Italian as ‘grated bread’ and is the word used for breadcrumbs. 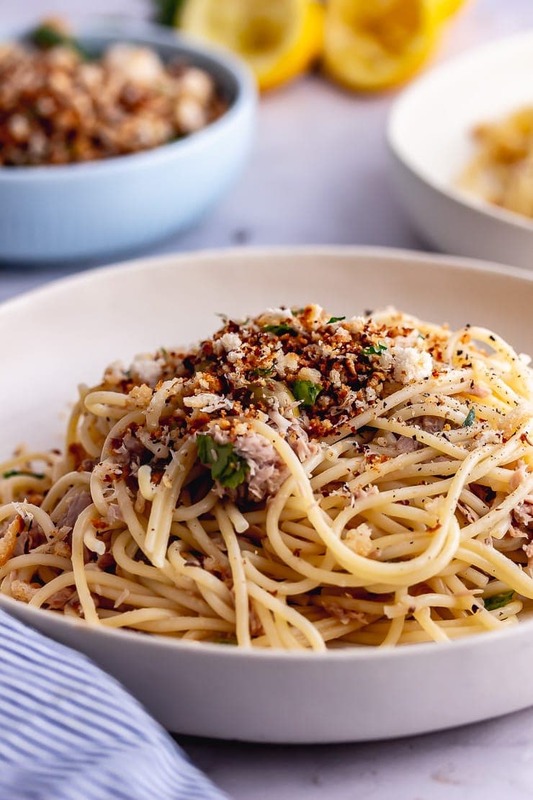 Here breadcrumbs are simply fried until crispy with chilli flakes and garlic for a huge amounts of flavour and a crunchy element to this tuna pasta. Want more? 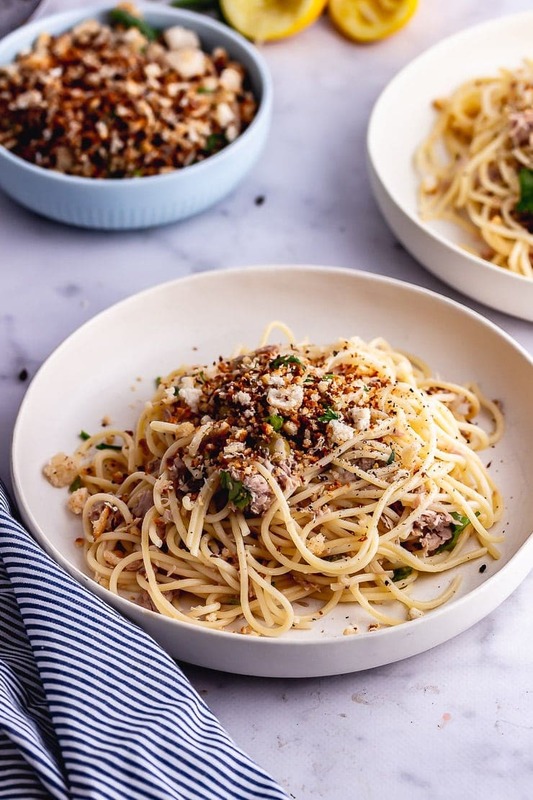 Try these other simple pasta recipes! 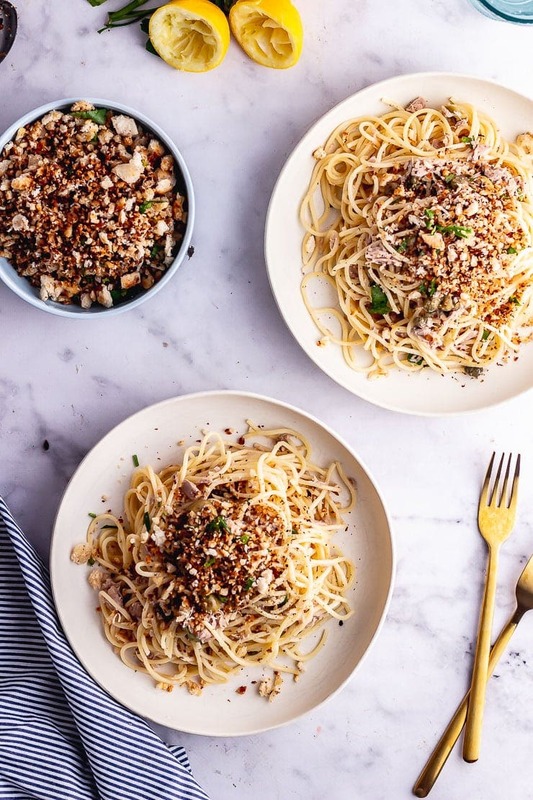 WONDERING WHAT TO DO WITH THE LEFTOVER INGREDIENTS YOU’VE GOT FROM MAKING THIS 15 MINUTE TUNA PASTA WITH PANGRATTATO? 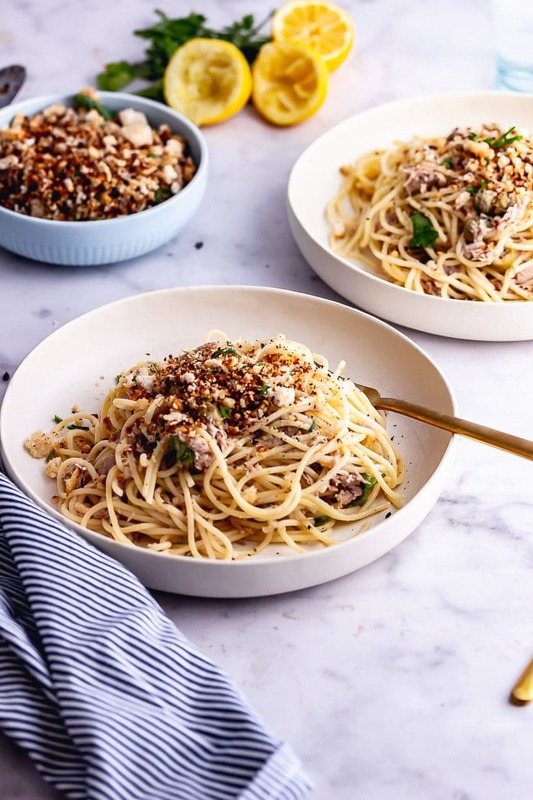 This 15 minute tuna pasta is light and healthy plus it's so simple to make thanks to the canned tuna. It's great served hot or cold and makes perfect leftovers for lunch the next day. Cook the spaghetti according to packet instructions. Reserve a mugful of pasta water (approx. 100ml/1/2 cup) then drain the spaghetti. 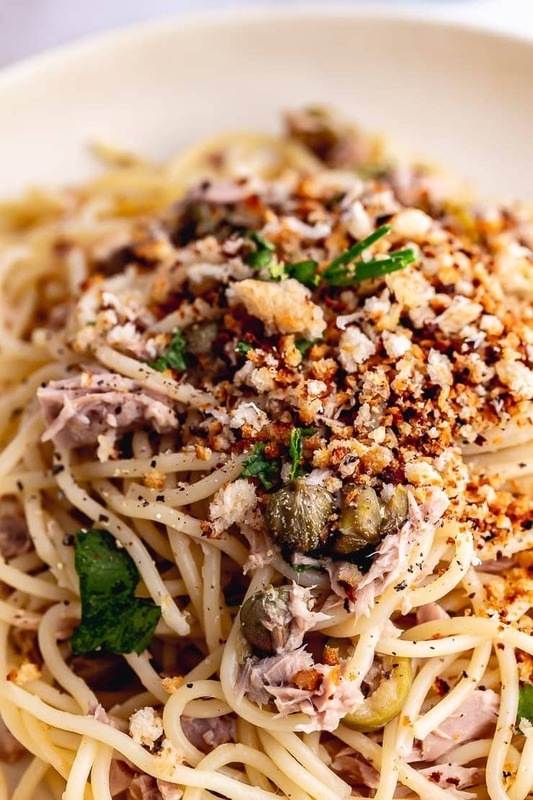 Put the tuna in a large bowl and add the capers, olives, lemon juice, parmesan and parsley and mix. Add the pasta, olive oil and pasta water and toss. 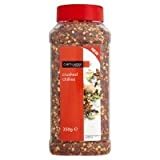 Heat the olive oil in a frying pan over medium high heat and add the breadcrumbs, chilli flakes and a big pinch of salt. Saute for 5 minutes then add the garlic and cook for another couple of minutes. Remove from the heat and mix through chopped parsley. 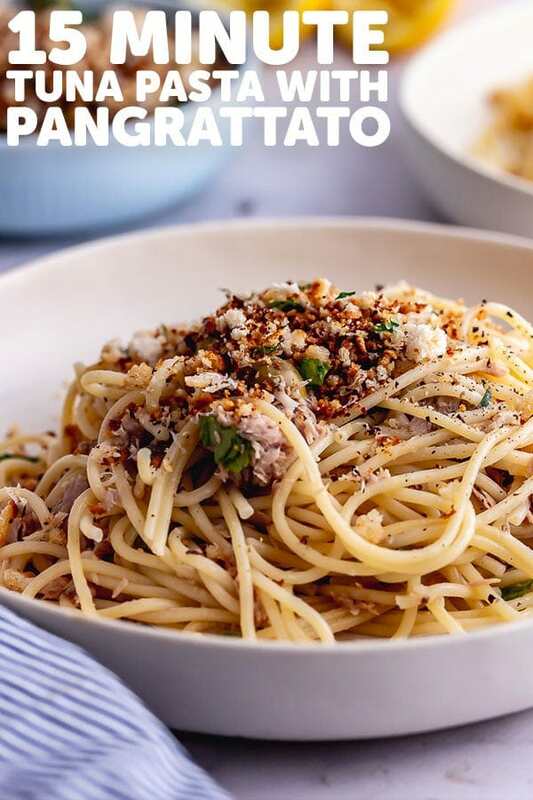 Serve the pasta sprinkled with the pangrattato. 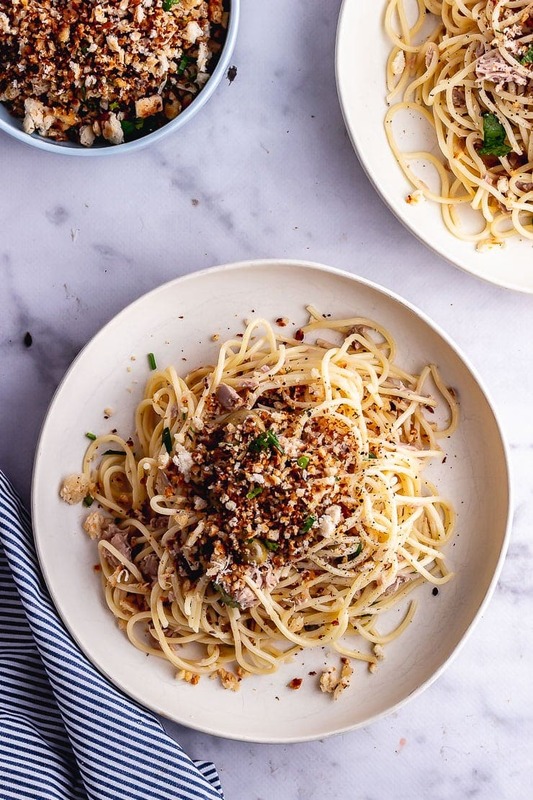 What an amazing looking recipe – hard to believe that’s canned tuna! 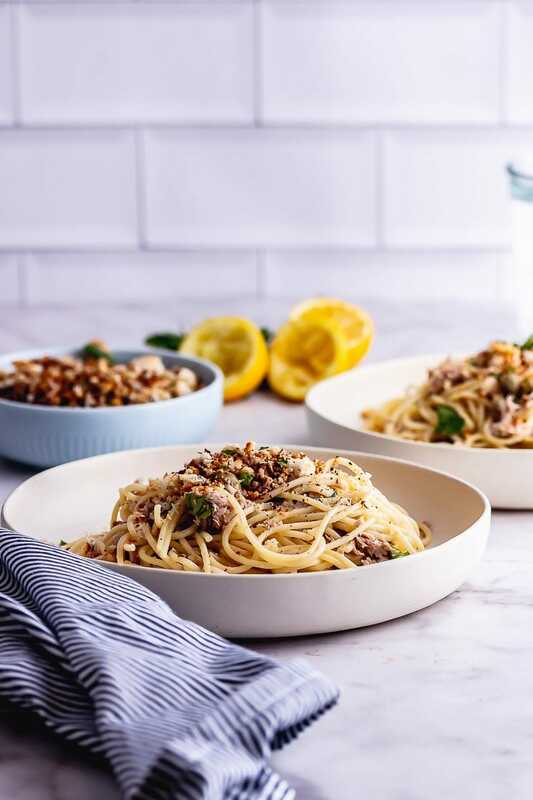 I was just talking to my fiance about never having tried Tuna Noodle Casserole – I’d MUCH rather try this recipe instead! 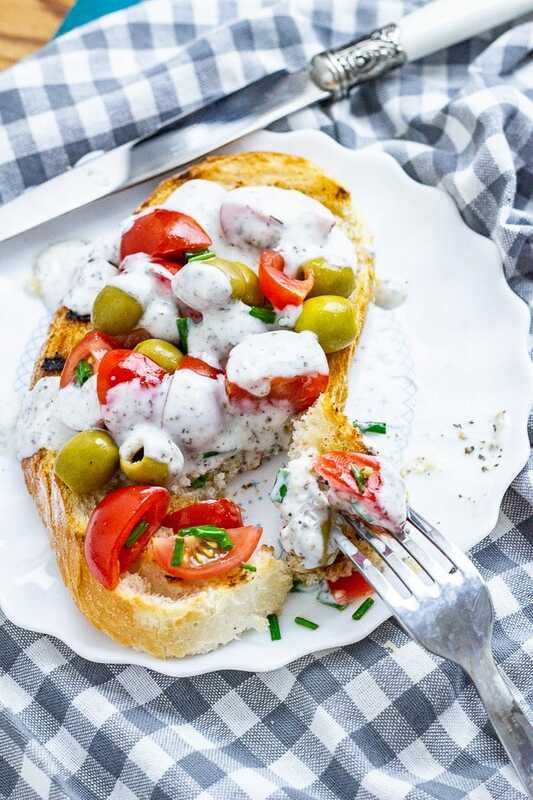 Such an easy share for the busy weeknight & also the weekends! Thanks much & I loved the way you paired the flavors. Brilliant! 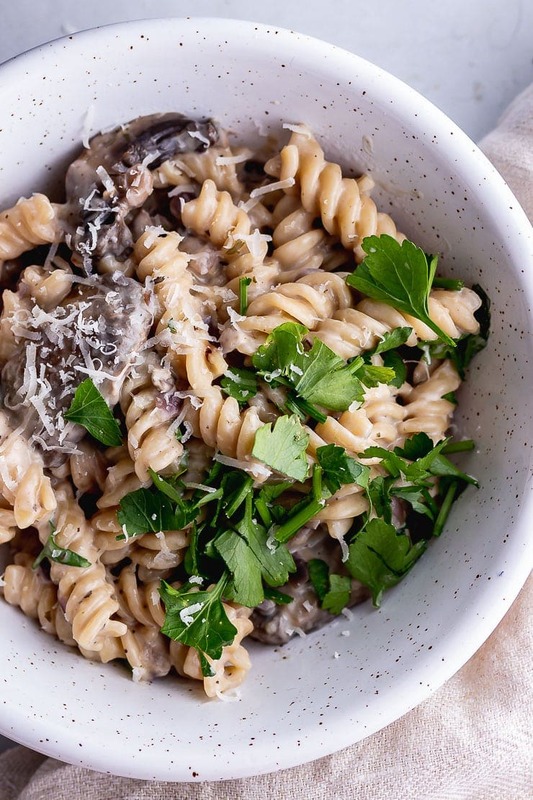 You can never beat a good pasta dish and this looks just perfect! And I bet the leftovers will taste even better the next day! So happy to stumble on this recipe. 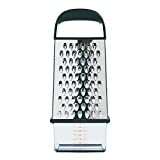 I was looking for a new tuna pasta recipe. The one I have makes wayyy too much and takes too long. Love this quick 15 minute version. I have way too many nights when I can’t be bothered; this is a lifesaver. I love the brightness that the capers and olives bring. I bet that pangrattato rounds out this dish texturally, too. 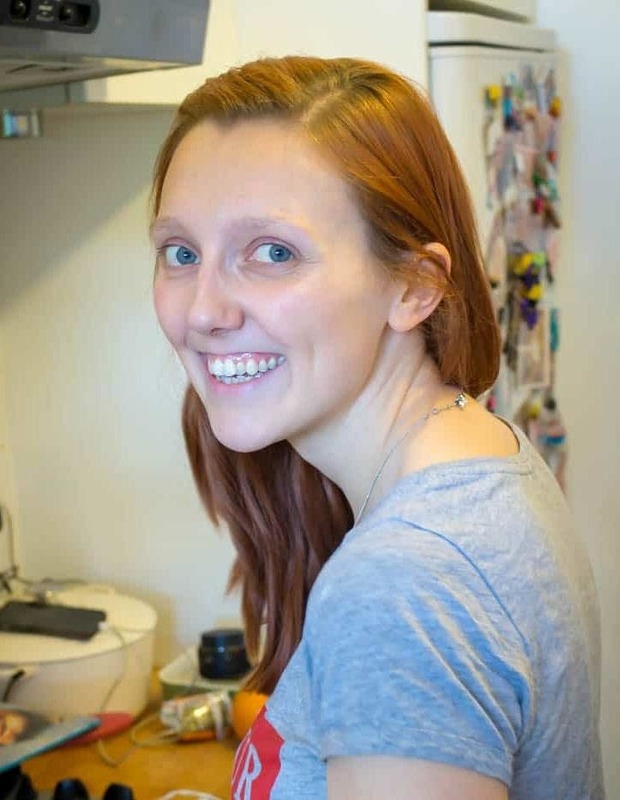 I can’t wait to check out your other 15 minute dishes.